The United States Marine Corps (USMC) is unlike any other branch in the US military. With its own specialized force of vehicles from aircraft to tanks, they provide the shock force for any assault amphibious landing. They have over 180,000 men and women (as of 2017) under arms and, under the 1947 National Security Act, they have the authority to develop vehicles especially suited to their scope of operations. 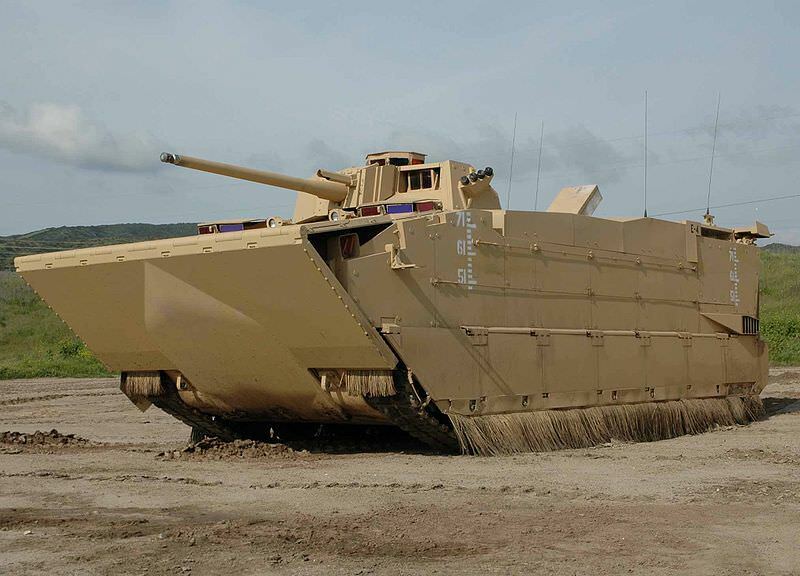 It is perhaps surprising then, that within the best funded military force in the world, the USMC does not have a modern amphibious (or amphibian) vehicle to enable them to fulfill their core roles. 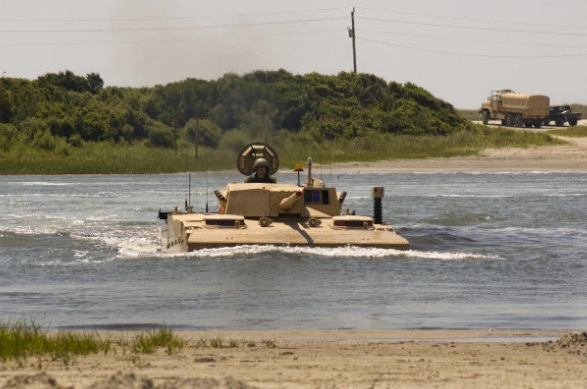 Such a vehicle has to travel quickly across open water to convey troops from ship to shore, offload them under fire, and provide fire support for the assault. After this, it should then assume the ‘normal’ role of an Armored Personnel Carrier (APC) on land, and it is these requirements which produce overlapping and contradictory requirements from a vehicle. The first specialized amphibian landing craft, lightly armored, and fitted with a small turret or just open machine guns started just prior to World War 2 with the Alligator, followed by the LVT (Landing Vehicle Tracked) series of vehicles throughout WW2 and into Korea. Progressively, these vehicles evolved with improvements to the armor and water speed with a dizzying array of specialized variations and experiments. If those early vehicles are considered a first generation, then the post-Korean War world showed the USMC a need for a new design of LVTP, and thus, the second generation of LVTs was created; the LVTP-5 being an example of this new generation. These second generation vehicles had incorporated the lessons from WW2 and Korea: more speed in the water, more armor, better firepower, and improved carrying capacity were all delivered but the LVTP-5 was a huge target, unsuitable for use on land as an APC. A long series of developments followed, with the LVTPX-12 slowly evolving into the well-known shape of the LVTP-7 in the late 1960s and early ’70s. This third generation of LVT’s was sleeker than the massive size of the LVTP-5, with a better-shaped front delivering better in-water performance, and improved automotive elements providing better performance on land. The armor was still lacking though, and whilst this LVTP-7 remains in service having gone through its own generation of experiments, upgrades and improvements, it was clear from the late 1970s, with the lessons of Vietnam fresh in the minds of the military, that it too was not ideal. Better than the LVTP-5 certainly in terms of mobility, and significantly better in terms of protection and mobility than the M113s the USMC were using, it was still not capable of fulfilling all the roles the Marine Corps required. Work on the fourth generation of ATV began by the end of the 1970s and a bewildering variety of technologies were investigated through the 1980s with everything from composite hull technology to hybrid drive and hydropneumatic suspension to mention just a few. 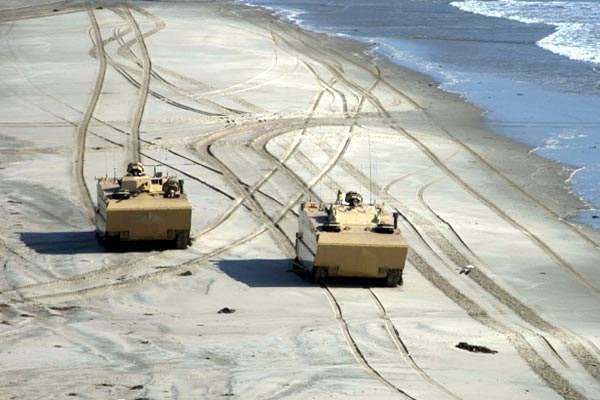 By 1996, the program was being called the ‘Advanced Amphibious Assault Vehicle’ (AAAV) and a Program Definition and Risk Reduction (PDRR) contract was awarded to General Dynamic Land Systems (GDLS) in June that year. The result of this generational development lasting decades and costing billions of US dollars was ready by the early 2000’s meeting all the USMC requirements for the first time ever. In August 2003, the Commandant of the USMC officially renamed the AAV into the Expeditionary Fighting Vehicle (EFV). The culmination of decades of development and billions of dollars, the EFV was finally unveiled in 2006. To complete the initial part of the contract for the EFV, worth US$216.9m, GDLS opened a new facility at Woodbridge, Virginia, known as General Dynamics Amphibious Systems (GDAS). The original requirement was for 1,013 EFV’s (935 Personnel type and 78 Command and Control type) for the USMC with a budget of US$8.5bn, but as costs overran on the project, the US$8.5bn would only pay for 573 vehicles instead. Assuming the ratio of personnel to command variants remained about the same, this would equate to 532 personnel and 41 command versions. This was still a significant number, but at a staggering US$24m each (roughly 7 times the price of an M3 Bradley IFV), these vehicles were significantly more expensive than any other ground vehicle in use in the entire US military. During consideration of the huge cost of the project, General Dynamics, the design lead, suggested reducing the order to just 200 vehicles as they had a significant investment themselves in the design and technology as well as concerns over the sustainability of their workforce. However, they were to be disappointed. The USMC was specific that they wanted a vehicle capable of being launched 25 nautical miles (46 km) from the target and come ashore under its own power at a speed of 20 knots (37 km/h). This ensured greater surprise as well as the protection of naval assets from shore-based weapons. The vehicle was to have a sea range of 250 miles (400 km) and land range of 345 miles (555 km) at speeds of up to 27 mph (45 km/h) in order to keep up with the M1 Abrams Main Battle Tank (MBT). The vehicle was to have a crew of three, a driver on the left, the commander on the right, and a gunner located centrally. Armed with a small turret with a stabilized 30mm cannon, the EFV was to be produced in two variants to meet USMC requirements. GDAS was the design lead for the EFV, drawing on decades of experience, modeling, and prototyping and, by mid-1998, the critical design review stage was completed clearing the way for assembly to begin by the end of the year. Construction started in December 1998 and the first vehicle (EFV-Generation 1) was completed the following June. With things moving relatively quickly and on budget, the USMC awarded General Dynamics a US$712m contract for the Systems Development and Demonstration (SDD) phase of the program in July 2001 with a goal for a constructed vehicle to be finished by 2003. This was a very ambitious target leaving everyone in doubt as to the urgency with which the USMC saw the replacement of their aging fleet of LVTP’s. Nine more EFVs (EFV-Generation 2) were to be constructed under this contract for testing including firing trials. Assuming trials were successful, full-scale production was to commence in 2005 at a low rate followed by high-rate production in 2008 finishing in 2018. The vehicles for the SDD phase though were to be built at GDLS’s Lima tank factory. A further contract from the USMC for US$15.9m followed in February 2003 to pay for the testing which included providing spare parts. As testing of components and system took longer than expected, the 2003 goal slipped to 2004, and then again to 2005. By December 2004 though, things were looking good for the EFV, but a disaster struck with a critical failure of the hull electronics unit (HEU) which totally crippled the vehicle making it unable to move on land or in water. This was not the only problem. 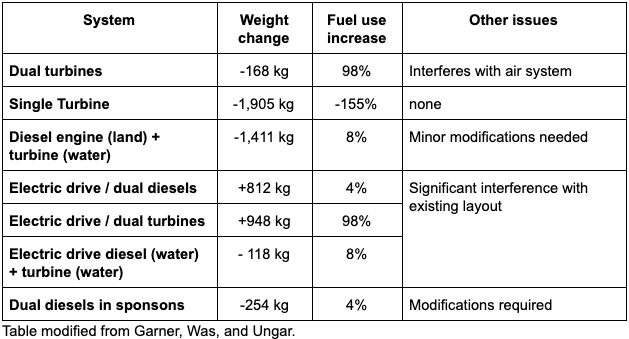 Going right back to the 1950s and through the 1960s, a lot of time and money had been spent of improving vehicle performance in water and the key findings were the same, reduce drag and improve the front shape of the vehicle. The flimsy M113 relied on a trim vane folded from the front which provided a small amphibious capability but was hopeless for open water. The LVTPX-12 morphing into the LVTP-7 had originally got a curved and blended boat shaped front, later changed to the much squarer front it entered production with. This front shape was good but not ideal. This new vehicle design would move the goalposts of design completely with the creation of a completely separate hull bow plane capable of being moved away from the hull allowing for high-speed water travel and then retracted for land use. This complex bow plane relied on equally complex hydraulics and these proved very problematic with numerous faults, failures, and leaks. The original requirement of 70 operating hours for the EFV known as the Mean Time Between Operational Mission Failure (MTBOMF), a measure of the reliability of the vehicle had to be reduced to just 43.5 hours in order to remain viable. By the end of 2005, with all of these problems, the finalization date slipped once more to a projected conclusion in 2007, still an ambitious completion date. In 2006, an operational assessment was made on the EFV, which was a total failure. Numerous breakdowns and systems failures cast a shadow over what was an advanced vehicle design seeking to overcome decades of sub-par equipment. It is accepted that during prototyping mistakes are made and things break, but the EFV managed just 4.5 hours between breakdowns and over 3 hours of maintenance each day for the tests. Other problems noted were that the vehicle was nearly 900 kg overweight and had issues with poor visibility during high-speed water operations, excessive noise, and issues relating to reloading the 30mm cannon. The 2006 tests were not seen as offering the potential that they had but, instead of fixing these problems, the US Navy (the Defense Department in which the USMC is administered) required the USMC to modify the EFV requirements for lower reliability levels and relatively minor modifications. These could almost certainly have just been done to the original EFV but, instead, a new contract for US$145m was awarded to General Dynamics for a design of the vehicle in 2007. 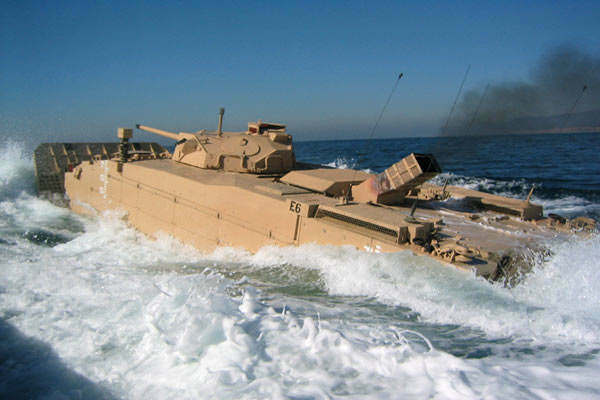 The goal was to have the new EFV ready for 2011, now 8 years behind the original target date, and much more in line with the rest of the development of the amphibious vehicle programs from the preceding decades, where the inability to accept minor faults and flaws led to a never-ending saga of development trying to produce a perfect gold-plated design. Work on building the new EFV was to start in 2009 with SDD II scheduled for 2011 and construction to take place at the tank production plant in Lima, Ohio. Reviewed in 2008, the design and production were seen as feasible and the go-ahead was given for seven new prototypes to be built with 400 fixes to correct reliability issues with EFV-1. Some testing was carried out in January 2009 involving the USS Peleliu (LHA5) off the coast of California with the USMC. Testing would later take place in Alaska as well. For testing in 2011, the USMC received 5 of the prototypes (4 personnel versions and one command version). The new program was expected to incur a further US$866m in development and US$10.2bn to fund production, which had been reduced to under 600 vehicles in an effort to save money. This colossal cost accounted for 90% of the USMC’s ground equipment budget. By 2010, a review of the future role of the Marine Corps had taken place under Secretary of State for Defense Robert Gates. That review found that the USMC had moved away from its traditional role of beach assault and that the idea of assaulting a fortified enemy coastline was basically obsolete. Instead, the USMC was, in essence, a “second land army” for the military and its vehicles needed to reflect that. Vulnerability to Improvised Explosive Devices (IED) due to the flat bottom of the vehicle remained throughout the design and testing. The M113 was notoriously vulnerable to mines and IED’s and the LVTP-7 had proven itself equally vulnerable too, with IED’s replacing landmines as the primary threat to APC’s in the low-intensity warfare environments on land the military was finding itself in. The spiraling costs and the inability to simply go ahead with production in spite of some flaws which could no doubt have been addressed later was to doom this project just as it had doomed the ones before it. The EFV has an unusual front profile due to the large moveable bowplane. This was a major failing in DD and so a new bow plane was developed in 2008 by Alion Science and Technology for SDD II. The personnel-variant of the EVP-1 carries either a full complement of 3 crew with 17 Marines or a load in lieu of the Marines up to a total load of 3.7 tonnes. The EVP-C1 command version has the same crew as the EVP-P1 but is fitted out with command and control stations linked to the USMC C2I and Fire Control systems in the back in place of the rifle squad. Positions are set for seven control stations. Under development at the time of cancellation was the incorporation of the Advanced Field Artillery Tactical Data Systems (AFATDS), Intelligence Analysis System (IAS) and advanced air to ground communications equipment. Both vehicle variants though were essentially the same. Access for the crew was via hatches on the roof, front left for the driver and in the two-man turret for the vehicle commander and gunner. The front right seat, which had initially been meant for the commander in the early days, was now set for the squad commander. The vehicle commander now had a better position in the turret from which to command the vehicle. Access to the rear troop compartment was by means of a hydraulically-powered rectangular door. Two additional sliding hatches were placed over the roof of the troop compartment. Unlike its predecessors, the Automotive Test Rig and the Hydrodynamic Test Rig, the engine for the EFV was not located in the front between the two crew positions. That idea was abandoned in favor of a centrally located engine behind those positions. The advantage of this move was that the crew positions were not crammed into the sponsons like the ATR and access to the engine directly from above was much easier. The disadvantage was that it reduced the crew space inside the back. Whereas the LVTP-7 could carry 21 troops in the back, the EFV could only carry 17. Illustration of the Expeditionary Fighting Vehicle (EFV) by Andrei ‘Octo10’ Kirushkin, funded through Paypal by our supporter Stephen Reah. In order to keep weight to a minimum and maintain protection levels, consideration was given to production of the EFV with composite armor technologies which had been tested and proven on the M113 and M2 Bradley. This would involve a hull consisting of woven aramid fibers in resin with a layer of ceramic tiles built in. This was sufficient to stop all small arms fire. The original AAAV requirement had been for protection against the Russian 14.5mm Armor Piercing (AP) round at 300 m (but this later seems to have been changed to 500 m) and 30 mm projectiles across the front 60-degree arc at 1,000 m. Production in this material would save a considerable amount of weight over traditional metal armors, although metal armors would still have to have been used in key structural parts of the vehicles and as the structural body over which the composite materials would be layered, providing the additional rigidity the vehicle would need. This took the form of a space frame body made from 2519-T87 welded aluminum. The rest of the armor was modular over this frame. 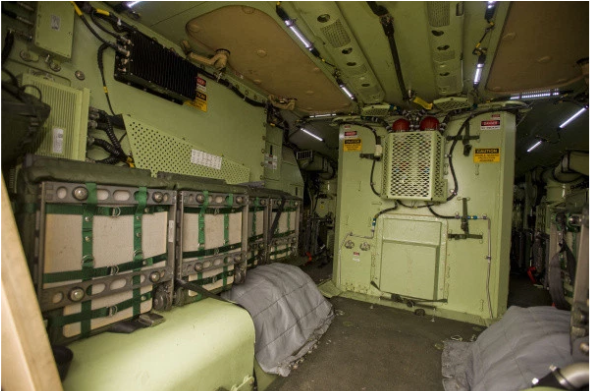 Internally, the seating for crew and troops are also armored, padded, and fitted with seatbelts. Firing trials both for land-based weapons and also for explosive blast resistance in the water. The white sections in the top sides of the hull are the large triangular section fuel tanks. Mine protection was provided for in the floor, exceeding the protection given by the LVTP-7. 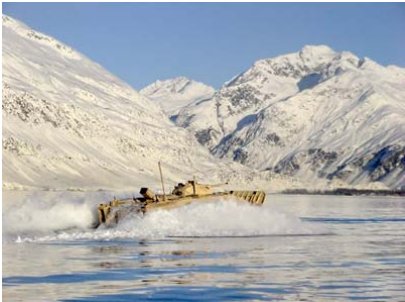 However, the very nature of the vehicle being amphibious, in order to reach high speeds in water it had to have a flat bottomed hull leading to an inherent vulnerability against mines and IEDs. One feature to increase survivability for the vehicle and crew was to carry the fuel tanks externally in large self-sealing pods along the roofline on each side. The initial demands for extreme long range could not be kept without additional tanks, but the placement of these tanks also added to the overall protection value for the crew inside sandwiched between the layers of armor. Spall protection was to be fitted inside as standard. 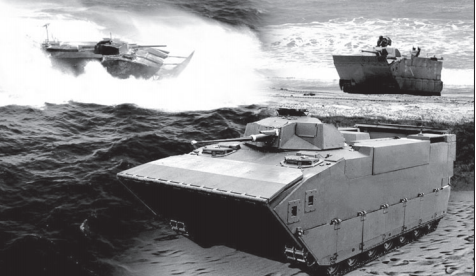 In the first quarter of 1997, GDAS sub-contracted part of EFV development to Textron Marine and Land Systems (TMLS) in a deal worth US$4m to design and construct the suspension system. The result was the production of 42 actively damped, retractable, hydropneumatic suspension units for the EFV prototypes which included spares. In 1999, however, TMLS got out of the defence industry and suspension production was switched to GDLS at their Muskegon, Michigan, facility. Suspension for the EFV is mostly hidden behind the large side skirts which are there not just for added protection but also to improve performance in the water as they reduce drag. Behind them are 14 retractable Hydro-pneumatic Suspension Units (HSU) on road arms, 7 per side. This system allows for the road wheels and track to be withdrawn upwards into the vehicle to significantly improve the speed in the water, as was previously tested and proven on the Automotive Test Rig and on an LVTP-7. When converting between land and water uses this APC undergoes significant changes. The front bow plane is pushed out and extended, the wheels retract and are covered with a chine flap, and a rear transom flap comes down at the back. A video of the vehicle converting to water-mode can be found at the end of this article. Originally, the EVP had been fitted with a double-pin steel track developed by United Defense but, following trials and development of a ‘band track’ made from reinforced rubber, it was fitted with that instead. This was produced by the Goodyear company and had the advantage of not being corroded by sea water but also reducing road noise, reducing weight, and reducing vibration. The EFV’s weaponry was to originally consist of just a single Mk.46 electrically-operated turret fitted with a stabilized 30mm cannon. This 30mm cannon was modified late in 1997 to the Bushmaster II which was delivered in 1998 and could be modified to ‘Super 40mm’ configuration and was ‘navalised’. The ‘navalisation’ involved the switching of some components from steel to stainless steel and titanium to prevent corrosion problems and was then designated Mk.44. The first two EFV prototypes were fitted with this gun and all subsequent production was to 30/40 Mk.44 standard. In the EFV, the weapon is known as the Mk44 Mod.1 30/40 and carried 55 rounds of armor-piercing (AP) and 160 rounds of high-explosive (HE) ammunition in ready-use bins with another 180 rounds stowed. Six-hundred rounds of 7.62mm ammunition were also carried as ‘ready’ with 800 more stowed. The Mk.46 turret uses the GDLS Compact Modular sight (CMS) incorporating a Gen-II Forward Looking Infra-Red (FLIR) sight, laser range-finder and day optics in a single Kearfott Dual Axis Head Assembly (DAHA). A single M240 7.62mm machine gun was mounted coaxially with the cannon and smoke grenade launchers are also fitted. Fire control was provided by a derivative of that on the GDLS M1A2 main battle tank. The power unit selected for the EFV was the German 12-cylinder MT883 ka-524 diesel engine delivering 865 hp on land and 2,700 hp at sea by virtue of two turbochargers, connected to an Allison X4560 6-speed transmission. This engine is produced under license in the USA by the Detroit Diesel Corporation. Propulsion on land was via the tracks but in the water, propulsion was by means of a pair of 584 mm diameter Honeywell retractable water jets at the back. Each marine drive jet moved just over 3,100 liters of water a second providing a 400% increase in water speed over the AAV7A1. Other engines of the same approximate size were considered too in order to reduce costs, decrease fuel consumption, and to improve range. Of these, only a single turbine was considered viable but with the end of the EFV project, this was never carried out. As well as the electronic system for communication, the EFV was fitted with a General Dynamics stabilized thermal imaging sight, automatic fire detection and suppression system, environmental climate control, and laser rangefinder permitting fire on the move. Nuclear, Chemical, and Biological overpressure system and filters were fitted as standard along with five (2 electrical and 3 hydraulic) bilge pumps, air-conditioning, and fire suppression. The command and control variants were also to be fitted with the Tactical Combat Operations (TCO), the Advanced Field Artillery Tactical Data system (AFATDS), Intelligence Analysis System (IAS), and Command and Control Personnel Computer (C2PC) systems. Further, it would have had two Single Channel Ground and Airborne Radio Systems (SINCGARS), two Ultra-High Frequency (UHF) Enhanced Position Location Reporting System (EPLRS), and two UHF Have Quick II radios, which combined provided a fully integrated suite of electronics and communications equipment for liaising between land, ship, and air operations. There are some visual differences between the prototypes indicating some changes were made even during prototyping. These changes included repositioning or removing what appears to be a vent on the rear hull side as a hangover from the AAAV design. The rear underwent changes too, with the rear side vents for venting excess heat from the radiator and equipment on some vehicles being a pair of vertical grilles and a polygonal shape on others. The USMC, since the start of WW2, lacked a vehicle capable of getting them quickly and safely from ship to shore to assault and seize an enemy beach, followed by supporting land-based operations. Various vehicles had come and gone from the lumbering hulk of the giant LVTP-4 to the sleek but vulnerable LVTP-7. In 2006, they finally got a demonstrator vehicle capable of meeting their unique needs. The EFV was the result of decades and billions of US dollars of research but it was not without its flaws. After so many years of waiting without a suitable vehicle the rush to get to SDD phase had proven costly for the EFV. Across the course of development of the EFV from AAAV, 19 prototypes including those of the Automotive Test Rig (ATR) and Hydrodynamic Test Rig (HTR) were built. Whilst technically a tour-de-force, the budget had spiraled out of control and the overall reliability and performance had been underwhelming. On 6th January 2011, Secretary of State for Defense Robert Gates, following advice from the Secretary of the Navy and Commandant of the Marine Corps, killed the program. 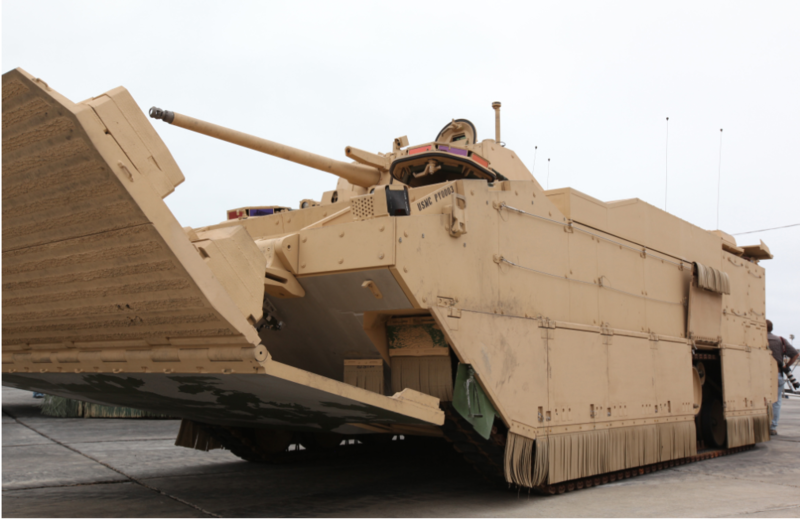 Thereafter, the USMC started a new project, the New Amphibious Combat Vehicle (NACV) renamed shortly after to the Amphibious Combat Vehicle (ACV) program with a goal of replacing the LVTP-7’s in the following four years. Some technology from the EFV program would be included within the ACV work, but for all of the urgency and the money spent, the EFV was over. The rush to finally get a replacement and the vehicle the USMC had always needed had led to faults and increased costs. Whilst these could no doubt have been ironed out once the vehicle entered service, the desire to have a ‘perfect’ system meant it was over, the result being that the USMC was left to fight on for many more years with old, out of date, and inadequate equipment. Sometimes even a new system with faults is preferable to an old and obsolete one. The EFV was an example of this and the failure to adopt it keeps the LVTP-7 in service with no suitable replacement meeting the demands made for the EFV. A situation which endures to this day. Armor Welded aluminum frame hull with modular elements – protection against 14.5mm Armor Piercing (AP) at 300m, and 30mm projectiles across the front 60-degree arc at 1,000m. Exact layout is classified. Armor Welded aluminum frame hull with modular elements – protection against 14.5mm Armor Piercing (AP) at 300m , and 30mm projectiles across the front 60-degree arc at 1,000m. Exact layout is classified. Bosworth, M. (2012). Amphibians, Unmanned Vehicles and Arctic Initiatives: Projects of the NAVSEA Technology Office. Forecast International. (June 2011). Expeditionary Fighting Vehicle. Government Accounting Office. (2006). Report to Congressional Committees: Defense Acquisitions: The Expeditionary Fighting Vehicle Encountered Difficulties in Design Demonstration and Faces Future risks. US House of Representatives. (2008). The Expeditionary Fighting Vehicle: Over budget, behind schedule, and unreliable. USMC Systems Command. (2009). Sea Skimmer: Technology breakthroughs lead to dawn of EFV. Janes Armour and Artillery. (1985/86/87/88/95/96/97/12). Janes Information Group. General Dynamics Land Systems (GDLS) promotional video.